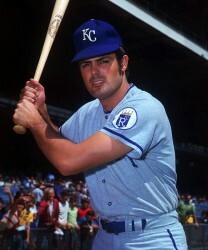 Louis Victor Piniella was born on August 25, 1943 in Tampa, FL. He attended Jesuit High School of Tampa where he was an All-American in basketball. For college, he attended the University of Tampa where he was an All-American in baseball. His professional career in baseball began with the Baltimore Orioles in 1964. From there, he played with the Cleveland Indians, Kansas City Royals, and the New York Yankees. As a player, Piniella accumulated five American League East titles, four American League pennants, and three World Series championships. After retiring, Piniella became the Yankees batting coach. In 1986, he was promoted to manager and then to general manager in 1988. “Sweet Lou” moved to become the manager of the Cincinnati Reds between 1990-1992, during which time the Reds won the 1990 World Series. From 1993-2002, he managed the Seattle Mariners before leaving to manage the Tampa Bay Devil Rays in 2003. He served as the manager for the Devil Rays for three seasons before leaving once again for the Chicago Cubs. Piniella’s awards include: 1969 American League Rookie of the Year, 1972 All-Star, 1995 and 2001 American League Manager of the Year with the Mariners, and 2008 National League Manager of the Year with the Cubs.